A gender neutral nursery that is nearly 100% DIY! I wanted to loosely base everything on the theme of "You Are My Sunshine". I didn't want to go completely literal with the theme, so I chose colors that I felt really embodied the feelings of sunshine. Of course, you can't have sunshine without some rain clouds, so there is a little grey present as well. I don't think I have a specific style. I just sort of put things together in ways that make me happy. Unfortunately, painting wasn't an option, as we rent. So i wanted to make the room really bright and colorful to minimize the "blah" factor of my off-white walls. The bedding was based on a simplicity pattern that I made subtle changes to. (Yes, I made a bumper, but I do not use it with the baby in the crib. I honestly just made it because I thought it was cute, lol). The mobile was one I purchased and just didn't use the little animals that came with it. I made the clouds and sun out of felt and attached with cord. The rugs were made in the shape of clouds using faux fur fabric that I dyed grey. I used heavy duty shelf liner and glued it to the back to keep the rugs from shifting around. The two upright bookcases are "Billy" from Ikea, with doors added to them. The back was covered in coordinating yellow fabric. I had the white wicker baskets from when my daughter was little, and I simply made new basket liners for them. The window bench is an Ikea Expedit that I turned on it's side. I made a cushioned top for it and covered the front of some Ikea bins, tying it all together. The curtains are tab-backed... made with no pattern, just a few measurements I took from the window. The glider / ottoman were purchased on Craigslist and I re-upholstered them in the coordinating grey fabric. The two pillows are both hand made. The round one is a Simplicity pattern. The sunburst crochet lapghan was inspired from a picture I saw on this website, actually! I made the coordinating burp clothes with cloth diapers, and the cute little cloud napkin holder is from... you guessed it... Ikea. (So is the tall blue lamp). I made all the artwork as well. We removed the closet doors to fit the changing table in the room. I painted an Ikea closet organizer, and made custom storage bins for the changing table (as well as coordinating changing table pads). The sunburst mirrors were purchased at target and then painted yellow. I made the bunting without a pattern as well, just using fabric remnants. Hmm. Maybe the canvas artwork? Or the mobile. Okay, probably the mobile. It's really stinkin' cute. Start early! I began this effort at about 16 weeks pregnant and everyone made fun of me for starting the nursery so early. However, baby was three weeks early, so I ended up not wrapping everything up until a month after he was born. I didn't have much to finish, but it was still hanging over my head until then. 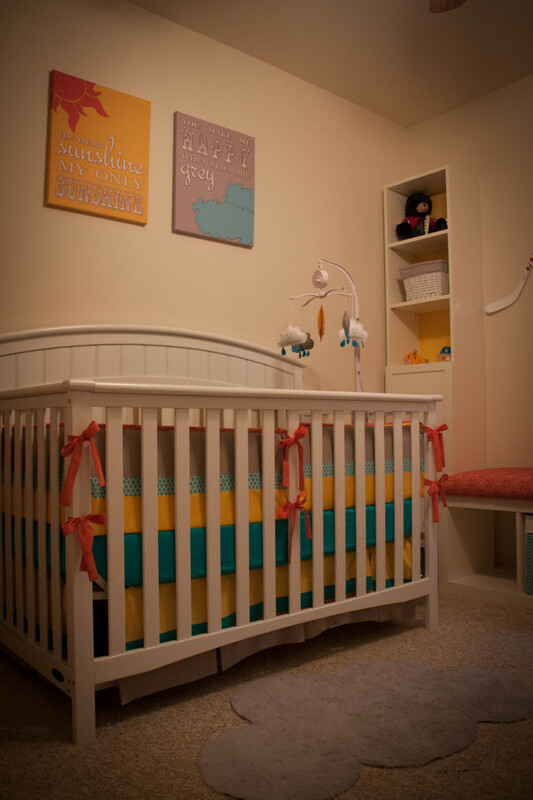 Such a colorful, bright and festive nursery.